Competitive smallholder livestock production conference participants with Botswana’s Hon Patrick Ralotsia, acting Minister of Agriculture (photo credit ILRI/Muthoni U. Njiru). On 4-6 March 2015, over 100 scientists, development agents, government institutions staff and private operators from Africa and other parts of the world converged in Gaborone, Botswana to discuss policies for competitive livestock production. Competitiveness of smallholder livestock producers is indicated by levels of productivity (stocking rate, calving rate, birth rate and mortality rate), profitability (quality of products, prices) and efficiency (cost of production). Although there are indicators of competitiveness, smallholder livestock producers continue to be affected by poor policies, little support from institutions and government, lack of subsidies and little training of farmers..
Equipping farmers with skills and knowledge through frequent capacity building sessions. 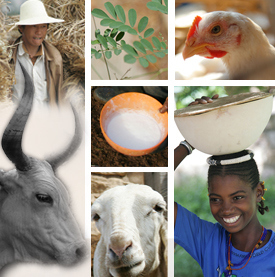 Providing subsidies to smallholder livestock producers. Participatory approach to policy formulation where all stakeholders in livestock production are consulted. Private-public partnership in policy implementation. This sub-theme featured a story by Patrick Malope and two presentations on the ‘Role of collective action in enhancing the competitiveness of smallholder livestock production: Case of Namibia’ and ‘Dairy business hubs as collective action in enhancing competitiveness of smallholder producers in Kenya’. Farmers to be trained on the benefits of collective action and mentored in creating groups. Visionary leaders to guide the groups towards a common goal. Governance structures that facilitate group decision-making, coordination and management. Financial support by government providing incentives and lowering lending/interest rates. Government and other stakeholders to set up and support farmer-to-farmer groups benchmarking, where farmers share best practices. Effective policies that protect smallholder farmer groups from unfair competition. Government to improve transport systems and encourage the use of technology in disseminating information to farmers. If implemented, the recommendations from this meeting could boost the competitiveness of smallholder livestock producers in Africa. See presentations of this event. Tags: ACIAR, BIDPA, Hikuepi Katijuongua, Sirak Bahta. Bookmark the permalink.